I like hats. The coat rack in my library holds no coats but is adorned with hats. One informs in Chinese that I have climbed the Great Wall of China. Every once in awhile on a sunny summer day when I am wearing it, a Chinese visitor to the Vineyard will stop me and exclaim about it excitedly. It’s a bit of an exaggeration. I haven’t climbed the Great Wall of China. I have walked along it. Another favorite is a genuine wild west cowboy hat. Another made of rabbit fur comes from some frigid part of Russia. There is a yellow cap from Austria emblazoned with the name of Johann Straus and bearing a picture of the king of waltz. Another is a bright red cap that came from Lafayette, La. There’s a floppy Sunbonnet Sue number (embarrassingly so labeled where everyone can see it). There are wide-brimmed, beribboned straw garden party hats and tight-fitting, toasty warm close-to-the head hats from Scandinavia. There’s a wide-brimmed black hat with scarf attached that resembles something a Roman Catholic prelate might have worn. Of course there’s a yellow sou’wester for stormy days on the water, and another Chinese hat not made for stormy days since it is constructed from paper that wilts at the fall of a raindrop. Two high-quality handmade woolen ones are always show-stoppers. One came from Nova Scotia, the other from West Tisbury, where I admired it one evening at a friend’s and was told to take it home as a gift. And there is a red felt hat that is a dead ringer for the one that Hilary Clinton wore at her husband’s first inauguration. I attended that inauguration. Would that I could have worn it in 2016 for her inauguration. At the counter in South Station that sells hats and gloves, I chose it from the array on sale only because it was black and matched my coat. I asked if there wasn’t a black cap that said Boston instead but was told a Boston hat would cost me $20, whereas the G.O.A.T. hat was only $10. As I put my $10 down for it, I remembered with a chuckle the goat family that had camped for a cold winter month in a Chilmark summer house a few years ago. The goats had slept comfortably on the sofa, opened sideboard drawers to see what was inside, eaten whatever the summer owners had left behind and had a rollicking good time for awhile. My G.O.A.T hat, if anyone on the Vineyard asked about it, was being worn as a tribute to Chilmark goats, I would say. The first Bostonian who stopped me and asked where he could buy a G.O.A.T hat was in a Market Basket parking lot I was crossing in Chelsea. 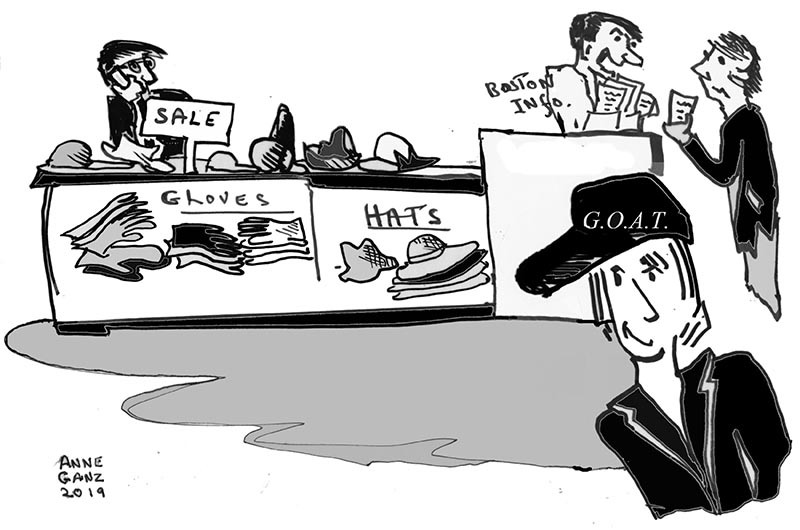 The man said he had a friend whose nickname was GOAT and he thought he’d like to have a hat bearing his nickname. That seemed reasonable enough. Then on Beacon Street someone tapped me on the shoulder and asked about my hat. In Harvard Square I had several inquiries. I tried to smile agreeably and wonder what was so special about G.O.A.T. When the bus got me back to the ferry in Woods Hole, I had to run to make it aboard — or so I thought. Not so. A crew member saw my hat and shouted: “Hold it.” As soon as I was safely on board, he and two of his fellow crew members wanted to know where he could buy a G.O.A.T. hat before the game. That was before Sunday’s Super Bowl. Now I know the true value of my hat. Obviously I was not at a Super Bowl party chomping pizza. Instead I was enjoying French crepes at a dinner party, because around groundhog time in France, crepes are always on the menu. At the dinner party I told my hat tale and learned at last about my popular headgear. My fellow dinner guests informed me that G.O.A.T. stood for Greatest of All Time — and didn’t I know that quarterback Tom Brady was the G.O.A.T? I shamefacedly admitted I didn’t know. I also admitted that I had only been to one football game in my life — a Harvard-Yale game seven decades ago when I was at Wellesley College and in love with a Harvard man. Now of course I will wear my G.O.A.T cap with great pride, and I’ll ask a good high price if I am ever talked into selling it. Entertaining as always! Chuckled out loud repeatedly. A great way to start my day. Thanks Phyllis. Phyllis, what a truly wonderful story. Thank you so, so, so, so much for sharing it! Phyllis this is a wonderful story. Thank you. And, of course, I love the illustration. Well done. Love the illustration. Full of zest, which is perfect for the article.